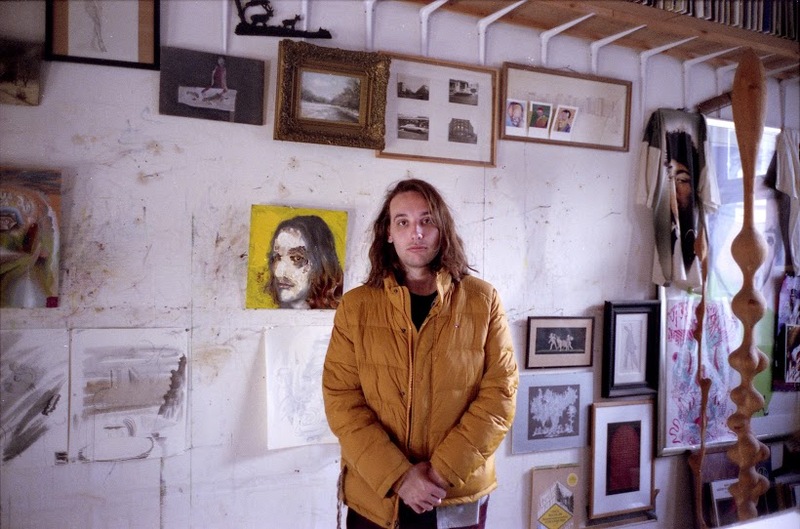 It had to be a portrait of Mitchel Van Dinther, aka Jameszoo, on the cover of Fool. The Dutch producer was on a hot streak of manifesting his wildest dreams, a portrait among them. It canonizes Van Dinther a living Stephen Dedalus. It is a portrait of the artist as a young man. From the twinkling and tinkering outset of “Flake”, Jameszoo is forging in the smithy of his soul an uncreated conscience. A debut record is made with every fiber of your being up to that moment. For Jameszoo it was also mostly done in the span of three years. Jameszoo describes Fool as naive computer jazz. It is a self-check that lays bare his limitations, despite having recorded sessions with over 25 players. He is ultimately the conductor, the arranger of these works, but maintains his position of tenderfoot. Even with the inclusion of jazz legends Arthur Verocai and Steve Kuhn, Jameszoo wanted to strip is debut of pretentious constriction. The record has many points of origin. They include an awareness that it’s impossible to make quintet music by yourself (unless you’re Madlib), the institution of Red Bull Music Academy giving Jameszoo access to a tribe of electronic musicians from equally remote places around the world, and a jazz swap among friends that became a podcast. It opened Jameszoo’s mind, got him out of his head and into a collaborative vision that could translate the music he was hearing in his head. It lifted the shackles of electronic music. But that’s not to say that collaboration was the answer to his problems, just like Dedalus came to question and rebel against his institutions. There was still an essence to be discovered for Jameszoo. An essence that requires exile. Before this album you released a few beat EPs. Were you feeling the limitations of electronic music? In a way. There’s a lot of stuff I can’t do myself in terms of playing those instruments. I could hear what was missing. In that way, I collaborated to hopefully make it better than it would be on my own. I don’t do it for the social aspect. I’d rather just do it for the music. You always end up meeting new friends, it has a social aspect, but that’s not really why I do it. I just do it because I’m missing this or that. That’s how I work mostly. Before this record, were you completing songs with the idea that you heard additional sounds, but they couldn’t be part of the final work? I wasn’t aged within that jazz genre too much. It was even more naive than it is right now. I’d slowly find out about these great records and great musicians. You kind of develop more of a taste. When that happened I started to see where the limitations were and where I’d have to work with different people. I guess, 2014. I’d just done the Red Bull Music Academy. That was May 2013. It was just a hobby that turned out to be a job in the end. I wasn’t taking it too seriously. Me living in this small town where there’s no one doing what I was trying to do, you’re not really sure if it’s an actual thing that you’re doing. You can see musicians like Flying Lotus doing stuff across. But it’s not really graspable of how that big that is and if you fit in that scene. There was no scene here. I got into RBMA and I just met people that were doing the same thing all over the globe. That made me think a lot. I got more and more into the music. Beginning of 2014, I started to write the first compositions that became Fool. How did the Yujyou podcast come to be? Me and my buddies were listening to a lot of jazz stuff. Collecting it and sometimes making mixes, but just for ourselves. We started making these in 2013. I’ve known these guys for a minute. They don’t make music for themselves, but they do like jazz music as much as I do. It was kind of inspired by Madlib’s Mind Fusion. We heard that Mind Fusion Vol.2 with all the jazz in there. Through these mixes he introduced us to so much new music that we kinda wanted to do the same. Do you feel like your involvement in the podcast fed into the direction of Fool? It keeps you finding new music. You want to always find that one thing that’s completely obscure. Through that I got into stuff I didn’t know that broadened my taste. It kind of led to recording an album that sounds like this. What was it like knowing you were going into a record where you’re not even certain you can pull it off? It was nerve wracking to be honest. I’m not classically schooled. My aspirations were a bit much when I started. It wasn’t too good for my sanity. I ended up recording 25 musicians or something like that. It was almost like an orchestral thing. It was pretty heavy. If an idea like that would pop up in my mind now, I’d definitely think it over a few times more. It was fun and I’m happy about the record, but it was also completely nerve wracking. Which is also fine because if you get put on the spot like that, I think you learn a lot faster. I needed someone to evaluate the record before I was turning it into the labels. I couldn’t hear myself anymore. I was at a certain point where I didn’t know if what I did was any good. With the electronic stuff I kind of stay a bit more focused, I have more of an idea of what the record became. With this record after a while I was not sure what it was even. I’m not sure if it’s good or if it’s bad. It’s just what came out. How did the record go from being inspired by Arthur Verocai and Steve Kuhn, to featuring Verocai and Kuhn? The Arthur record is definitely a record you bump into through samples. I think Madlib used it and Doom, those guys. There’s a certain beauty in that record. It’s very composed and the sound is just amazing. It’s quite easy to digest but there’s still certain layers to it. That record just really developed with me throughout the years. My friend Kees Heus, who’s the owner of Kindred Spirits, he was promoting shows in the Paradiso in Amsterdam. he booked Arthur Verocai. He kinda tipped me on it. He was like we got Arthur on this day, if you want to work with the guy shoot him a line. I was kind of amazing how easy that went. It gave me the courage to try the same thing with Steve Kuhn. It took me maybe a year to convince him to be on the tune. I’m really happy he did. When I heard that self-titled record he did in 71, that just completely changed the way I saw piano music. He was definitely not doing what everyone was doing on that record. There were so many layers and levels to what he was doing, even the composing and the songwriting was just too good. It really inspired me. The press release makes it seem like you can just write a message or call up an influential musician from ages ago and all the sudden you’re in a session with them. I’m definitely convinced that if someone is into someone’s creative output, you should try at least. It’s not guarantee that it will work. These guys started out somewhere as well. Of course it’s probably a bit weird for Steve to sit in the studio with this young dude, while he worked with John Coltrane and all these amazing musicians. It kind of weirded me out as well. To think this man used to work with Coltrane. But I don’t believe in things like a long shot. I don’t think that exists. [Philip Akkerman] said it was a silent dream, to one time do a record cover and that’s it. Yes, tell me about that portrait of you by Philip Akkerman. He did only self-portraits for 35 years straight. He’s completely famous for that. I just texted him like ‘hey, do you want to do a non-self-portrait?’ and he was like ‘yeah, let’s do it.’ It’s just the weirdest thing. Like he did this concept and he kept it going for 35 years and was like yeah, of course I’ll do it. He’s the most amazing painter. In that respect, what gave you the idea that a guy who’s been painting himself for 35 years would be interested in painting you? That’s the funny thing. Arthur Verocai is on the record, Steve Kuhn is on the record… maybe I’m on a lucky road right now. I just tried it and he was an amazing man. When I got in his studio, his son was called Bootsy, named after Bootsy Collins. He made paintings for Bootsy as well. He is a major music freak. He said this was a silent dream, to one time do a record cover and that’s it. I just came at the right time. I definitely don’t believe in ‘that’s one bridge too far’ or upper echelons and such. With Steve, were you suggesting a cover? Or did it come naturally? What I kind of like about that jazz tradition of the standards and the covers is that it feels like an ancient sampling technique. You’re so inspired by something that you kind of recreate through that already recorded feeling. I really wanted to do a cover, when I heard that for the first time that just really had an impact on me. I was going to do it if he was working on it or not. I sent him a pre-recording I did and he liked it. I think the essence of good music is there’s not too much stuff that could have been left out. You recorded a lot of musicians, but nothing about the album feels overwhelming in that way. It’s contained and simple. So how did you arrive at that result? I’m glad you hear it like that. That’s what I really tried. It was the hardest thing to do for me. You end up recording way too much. I think the essence of good music is there’s not too much stuff that could have been left out. I tried to get everything out that was unnecessary for the feel of the music. That’s honestly what took me the most time. That was months. It was a very delicate process. It’s also completely time consuming stuff to go through. 120 gigabytes of recordings, listening to every thing… yeah, that took me a minute. Jameszoo in the studio with Arthur Verocai. Did you hear something in your sessions that informed this intent to pursue essence? It’s definitely how I receive music. When I listen to it, I really hear a lot of stuff in recorded music that I feel like it’s just unnecessary elements. It puts me off really fast. The essence is just what’s really beautiful about music. That’s why I think a jazz trio is just amazing. It happens a lot in electronic music as well where it’s just layers and layers of sounds and soundscapes and audio designs. I’m not really into that stuff. When I heard the second James Blake album, there was this one song on there “Retrograde” that was so completely amazing how he achieved to do something with so little, but still so impactful. I was that guy that used to be 60 layers of sound design and such. I’m really trying not to do that anymore. So biggest challenge was finding the essence of this record? Completely. When you’re insecure about something you do way too much. It’s really easy to cover up a bad composition with a lot of elements. I think the core of a good composition is that it can work with not a lot of elements. Did you feel like completing this record and doing so in a way that you’re not hiding, did it give you confidence? You get confronted with who you’ve always been doing it. I feel more aware of what the essence is now. It’s easier for me now to go from my head to the computer or to the piano than it was before. It helped me listen. It’s easier now for me to make new music than it was three years ago. It’s nice that for many this album will be your debut. You’re arriving with this awareness. I’m really happy that I took the minute to make this album the way I want it to be. I made a few EPs before and those could have became albums as well, but then I would have been really unhappy about it. I’m not too afraid to get on stage either, which is nice as well. I’m not super unprepared anymore. It gives me hope that it will eventually become something bigger than it is right now. Jameszoo’s Fool is out now on Brainfeeder.